Unicoi Preserves is now two years old! We celebrated our second anniversary last Saturday at Habersham Winery’s 24th Annual WineFest. It’s a fun event and this year there were 20 different Georgia wineries pouring their wines, as well as live music, great food and vendors. Reflecting back on the two years we’ve been spreading Unicoi Preserves, I can’t help but think of my friends who have talked about their children going through The Terrible Two’s. A difficult time for parents, toddlers often become frustrated and have temper tantrums. Toddlers feel overwhelmed learning vocabulary and independence. However, The Two’s are also a fun time, with more interaction, activity and personalities developing. Things that may help the frustrated toddler include outside playtime, naps and snacks. Good advice for toddlers and jelly makers alike. Every day is a new adventure for us and we are excited to start our second year with a new website, blog and infinite possibilities. Unicoi Preserves founders Suzy & Clark Neal took home the First Place and Consumer Choice Awards at the 10th Annual Jekyll Island Shrimp and Grits Amateur Cooking Competition on September 19th. Their recipe for Good Enough Shrimp and Grits with Candied Bacon included their Georgia Apple Cider Pepper Spread and four other Georgia Grown ingredients. This is the second award Unicoi Preserves has received for their Apple Cider Pepper Spread. Earlier this year, they were awarded as a finalist at the Flavor of Georgia, an annual food contest hosted by the University of Georgia College of Agricultural and Environmental Sciences with the support of the Georgia Department of Agriculture. Unicoi Preserves products are the Neals’ home recipes, made by hand in small batches. Using locally sourced fruit grown in their mountain region and picked at the peak of ripeness allows all varieties of their products to be flavorful and low in sugar with no artificial ingredients. Unicoi Preserves is proud to be a Georgia Grown company. 28 Aug We’re going to the Island! We have been jamming and jelly-ing as fast as we can around here, but its time for me to stop, and type a little bit to get you up to speed. We are one of 10 amateur cooking teams selected to compete at the Jekyll Island Shrimp and Grits Festival. The event is the weekend of September 18 and we’ll be cooking on Saturday. Cooking with local ingredients is important to us, so we have developed a delicious recipe that uses our award-winning Georgia Apple Cider Pepper Spread, as well as several other Georgia Grown foods. Our friends at Nora Mill Granary are the official grits sponsor this year, and they are the only grits that I’ve cooked with for over 20 years, so I feel pretty confident with the grits portion of our dish. Recipe development is fun, but finding local shrimp in our beautiful mountains is not possible, cause, you know, its the mountains, duh! We don’t buy pond raised shrimp from overseas, so locally, we haven’t had any luck buying shrimp for our recipe. Luckily, we are out and about pretty frequently to Atlanta, so I was able to buy wild caught Georgia shrimp at Buford Highway Farmers Market the last time we were there for product demo and they cooked up sweet and tender. Closer to home, we can find wild caught gulf coast shrimp in Gainesville at the Atlanta Highway Seafood Market. In addition to the seafood market, they have a restaurant as well that serves some of the most well-prepared and delicious seafood I’ve had. You should definitely check them out next time you’re in the area, especially if you enjoy Cajun & Creole spice. While we are no strangers to competition, this is our first live and timed cooking competition. It would be wonderful to see you on Jekyll Island and have you there to cheer us on. Let us know if you’re coming. If you can’t get away, you can follow along virtually through our hashtag for the event, #UnicoiPreservesGoodEnough. We’ll be posting to our Facebook, Twitter and Instagram feeds. Keep your fingers crossed that our recipe will be Good Enough to win! Hi blog readers! We’ve had a hectic few weeks here at Unicoi Preserves Spread Headquarters. Let me get you up to speed! Back at the beginning of June, we attended the Macon Georgia Grown Farmers Showcase. It was the first time we had been to an event that far south. We got to visit with a lot of the Georgia Grown companies that we’ve gotten to know since the Flavor of Georgia competition and meet a lot of nice people. As the day grew to a close at the Farmers Market, our smokin’ hot friend Abby J of Abby J’s Blackhawk Salsa, came by with a case of Lane Southern Orchard Ruby Prince peaches and suggested I go buy some as well. Clark tried to say we didn’t have room in the car because he knew how many peaches he’d have to help peel and process but I went ahead and got them anyway. I just couldn’t leave peach country without them, they were fragrant, delicious and perfect for jam. Unicoi Preserves’ founding principals are based on our belief of supporting local – farmers and business, and cooking and eating foods that are in season. As we worked together through that half bushel of peaches, we cooked multiple batches of jam and tweaked our recipe to dial in the ingredients that would allow those sweet Georgia peaches be the number one ingredient, not sugar. We were able to stay in line with that goal and are proud to introduce Salted Caramel Peach Spread. Weighing in at a mere 20 calories a tablespoon, we are a low sugar product with no artificial ingredients — sweet Georgia peaches lead our ingredients, not sugar. The FDA regulates the name of our products based on the sugar level, so we cannot call it Jam on the label, but you can, I won’t tell! 02 Jun Treehouse Master & The Mrs.
Clark and I had the honor and privilege of being the first overnight guests at the new tree house located at ZipNTime in Helen, Georgia. Camping is one thing, but staying in a treehouse, its even better and is the perfect way to rough it. We had talked about taking our camp stove and different things we could cook but when we got to Ingle’s and started discussing what to make, we noticed they had fried chicken on sale. Nothing says “Buy Me” on a Friday afternoon after a busy work week like crispy fried chicken and King’s Hawaiian Rolls. We picked up a few other camping necessities like Terrapin Recreation Ale and Jiffy Pop and headed back to the tree house. There’s a campfire ring by the cabin, so Clark staged our fire, we ate dinner and decided to go exploring on the dirt roads and trails that are throughout the property. There’s a beautiful little creek just steps down from the cabin and the mountain laurel and honeysuckle were blooming beautifully. After our hike, we came back and lit the fire and enjoyed some beverages, listening to the sounds of the forest. The whippoorwills were calling to each other and I learned that was one of Clark’s Granny’s favorite birds. He said she loved whippoorwills and owls, which are my favorite. We stayed up pretty late talking, reconnecting and watching the flames of the fire dance. There were so many stars and the moon was beautiful. sheets, a fluffy blanket and quilt. Our bed looked and felt quite cozy. I am a light sleeper but it was so dark, quiet and peaceful that I actually slept through the night. If you haven’t been up to ZipNTime lately, you may not know about all the enhancements they are working to make your stay so much more fun. Would you like to stay in the treehouse? They are running a contest until June 8th on Facebook and Instagram. Go on and enter, follow the directions and use #znttreehouse. I can’t wait to hear about your adventure! Cooking is challenging when your stove is on the fritz but its not impossible. I made this tasty, spicy & sweet slaw using our award winning Georgia Apple Cider Pepper Spread to accompany The Pioneer Woman’s Spicy Dr. Pepper Pork that I cooked in our crockpot. Clark got this crockpot when he went away to college in 1986 – 29 years ago! It still works perfectly, unlike our fancy Electrolux stove that we bought in 2011! Unicoi Preserves Apple Cider Pepper Spread + Duke’s Mayo + Georgia Grown Vidalia Onions = Yumm-O! Mix the ingredients in a large bowl & refrigerate for flavors to blend. *I omitted the jalapeno this time because the pork was spicy enough for our taste. The sweetness of our Unicoi Preserves Georgia Apple Cider Pepper Spread and the tartness of the Granny Smith apple combined with The Pioneer Woman’s recipe is the perfect trifecta for dinner on Taco Tuesday. We live and work in a vacation destination but often lose sight of that and sometimes work more then we play. Last week, we changed that and kicked off the start of a fun weekend by going zip lining at ZipNTime with our friends from Habersham Winery. I was apprehensive about going at first and didn’t mention being invited to Clark right away because I knew he would want to go. The more I thought about it, though, the more I knew it was silly to be afraid. It’s healthy to have respect for dangerous things but ZipNTime is a professionally built and maintained venue, not some third world set up built in banana trees. We had a little liquid courage in the ZipNTime event center and as part of Nacoochee Village, they serve Habersham Wine, beer and Ivy Mountain Moonshine. Afterwards, we headed outside to get geared up with harnesses and safety equipment. The staff was very friendly and helpful explaining things and helping us get into our harnesses. After some laughs and lots of pictures, we loaded up into the military transport vehicle and headed out on to the course. Along the way, we stopped at a treehouse they have built on the property that will be on a nightly rental program soon. Can you imagine sleeping outside in a treehouse in the forest, listening to the whippoorwills around a campfire, hiking private trails and enjoying solitude so close to town, yet so far? It’s quite lovely, I must say! Look for a blog post about our stay in the treehouse soon. We piled back into the transport and headed up to the start of the zip adventure. I was very nervous but I wasn’t the only one who was worried. 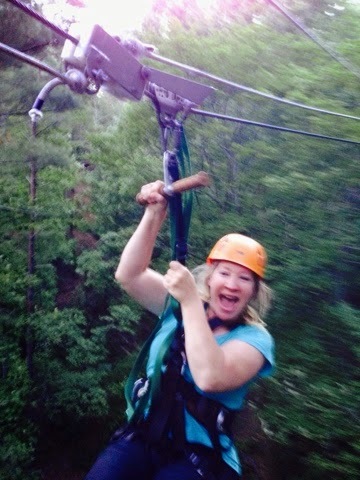 As we prepared to zip, I thought, don’t live in fear, go for it! Taking the step off the platform was not easy and as I was zooming through the sky to the next platform, there might have been some screaming heard throughout the Sautee Valley. As we went from platform to platform, I found myself really enjoying it and looking forward to my next turn and the next platform. The forest is so alive and vibrant now. Mountain laurel are in full bloom, the ferns have come in thickly and the trees have shed their winter drab brown clothes for fresh, lush green ones. The very last zip line of the day is the longest dual zip line in Georgia. Clark and I got to race on that and I won. It didn’t hurt that I had a head start and jumped off before him. Ha! When we got to the last platform, the sun was setting and there were deer on the ground looking up at us. A truly magical scene on a fun Thursday evening! Thank you Emily for including us and to Danny and the staff at ZipNTime for hosting us. We had a fantastic adventure and you have a first class staff and operation. I will not be fearful the next time we come a zippin’! Unicoi Preserves turned one year old at Habersham Winery at WineFest this past Saturday. What a fitting place for us to celebrate our first birthday since it’s where we debuted our products last May. It was really like Habersham Winery threw a party for us, with great live music from Tim P. White, awesome food from Mully’s Nacoochee Grill, 19 local wineries and a fun photo booth from Fancy Doodle. We had lots of friends stop by throughout the day, including Sarah who jumped in and helped us fix samples (Yay! Sarah) We were set up in the tank room and were in good company back there with Angie Tillman of Phickle’s Pickles fame, Christina from VIP Southern Tours as well as Southern Distinctions magazine. Pappy was set up out back smoking chicken and fish on his grilling planks and even glazed some with our award winning Georgia Apple Cider Pepper Spread. Saturday’s weather forecast was for sunshine and no rain, the perfect spring day in the mountains and we knew we were going to be busy. We actually shopped for sample supplies and started our prep work early in the week so we’d be organized for the day. Friday Clark packed the car while I readied sample supplies and took care of last minute details like signage (a big shout out to Betsy!) Amazingly, we were done in time to make the kick off of First Friday in Sautee at Sheilah’s Village Market. Sheilah and Steve have worked hard turning this monthly event into something that benefits the community. Every month, they, along with their employees and volunteers from the Smithgall Humane Society are at First Friday with food, music and beverages under the shade trees in their park. We saw people there over the course of the night that we’d lost touch with over the winter months and were able to catch up with everyone. At the end of the night, Clark and I sat out under the stars and bright moon talking to friends who wanted to know how we wound up moving to Sautee from south Georgia. We have a diverse group of friends but our common thread, outside the love of great wine and food, seems to be the peace and tranquility of the Sautee Valley and our mountains, along with the sense of the community that makes you feel a part of it, regardless of where you were born. There are some places that may make you feel unwelcome if you weren’t born and raised there, but Sautee isn’t one of them. “We weren’t born in Sautee but we got here as fast as we could!” Thanks Debbie & Donna! We’ve learned a lot over the past year and each day in the jelly business brings a new adventure and realization about who we are personally, as a company, how we fit into our local community, economy and the food community. What will the next year bring? I don’t know but I’m ready. Need a fast and tasty dessert that also happens to be gluten-free? My friend Donna is not only a great cook, she’s also the one who keeps my hair fabulous. I was in today to get my hair spiffed up and she told me she had made a delicious dessert. Flourless chocolate cake made more yummy with the addition of Unicoi Preserves. After she took it out of the oven and let it cool a few minutes, she poked holes in it and spread it with our Georgia Vineyard Spread. We both decided that we need to try it using Georgia Vineyard Fire. Spicy chocolate? Yes, please! Here’s a recipe from Epicurious that sounds very similar to what Donna made. Preheat oven to 375°F and butter an 8-inch round baking pan. Line bottom with a round of wax paper and butter paper. Chop chocolate into small pieces. In a double boiler or metal bowl set over a saucepan of barely simmering water melt chocolate with butter, stirring, until smooth. Remove top of double boiler or bowl from heat and whisk sugar into chocolate mixture. Add eggs and whisk well. Sift 1/2 cup cocoa powder over chocolate mixture and whisk until just combined. Pour batter into pan and bake in middle of oven 25 minutes, or until top has formed a thin crust. Cool cake in pan on a rack 5 minutes and invert onto a serving plate. Poke holes in cake and spread with Unicoi Preserves Georgia Vineyard Spread. The warm cake will pull all the yummy moisture into the cake. Unicoi Preserves has really been hopping here lately and my blogging has taken a bit of a backseat. I apologize and promise to try and do better this spring. I owe you a blog post about the Flavor of Georgia competition and Ag Awareness Day in downtown Atlanta that we participated in back in March and will get that post up soon. As a result of that competition, we were invited to participate in the Flavor of Georgia Showcase at Buford Highway Farmers Market in Doraville, Georgia. The event took place this past Friday, Saturday and Sunday inside the market, which was a true blessing given the rainy spring season we’re experiencing. My sister Betsy introduced me to BHFM many years ago and we both love to shop there, Betsy having the home town advantage since she’s local to the area. But any time I go down to visit her, I always bring a cooler so we can shop there together. With this history, it was especially exciting for me to be there in the store representing our brand, doing product demo and meeting the diverse shoppers that come in. We were set up under the tasting tent in the produce section with finalists and winners from the Flavor of Georgia contest. So many different nationalities of people shop in the market, but what I have found, a smile is a smile regardless of what language you speak. Connecting with people isn’t hard when you speak with food. The people working in the market have to be some of the nicest folks we’ve met as well. If you haven’t been to BHFM lately, you owe it to yourself to go and see what’s different from the last time you were there. The market is always evolving. Some of my favorites, besides the produce and seafood, are the expanded specialty cheese area, the European bakery area, and of course, The Flavor of Georgia area. Atlanta and Buford Highway Farmers Market thank you for the warm reception! We appreciate you supporting our Georgia Grown, family owned business and look forward to doing product demo there again soon. We’re always stirring the pot! Sign up to stay in the mix with recipes, events and more.